The advent of the computer tablet brought a new portability to internet entertainment. No longer restricted to bulky computers and laptops, you could carry it with you anywhere, anytime--the entire power of the web at your fingertips. It's a fact that when it comes to audiovisual content, there are times when you want the power of a large screen and state-of-the-art sound system to make the action on-screen really come to life. Conversely, those who have spent their savings on constructing the perfect home theater should not feel restricted only to what they can pop into a DVD player. Happily, the marriage of the internet and the large-screen is easily accomplished by hooking a tablet to your TV set, bringing the million-plus options of the World Wide Web to movie theater excellence. 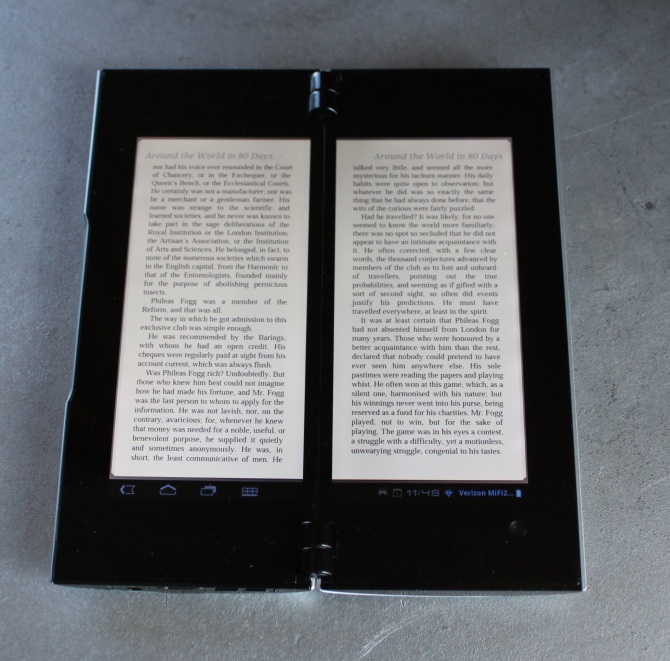 There are two primary ways of hooking a tablet to a television set. 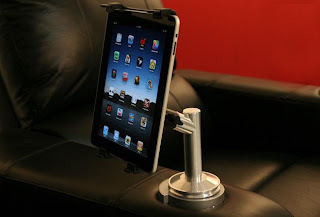 First, you may want to get an adjustable tablet holder which can fit easily onto your home theater seat's armrest, so that you can browse the web within arm's reach. Then, you can either use your home wi-fi to connect your tablet to your screen, or use a cable to connect to the HDMI (High Definition Multimedia Interface) ports on your tablet and TV. Each option will work, although if you're looking for an ultra-fast connection you may want to stick with a cable hookup. 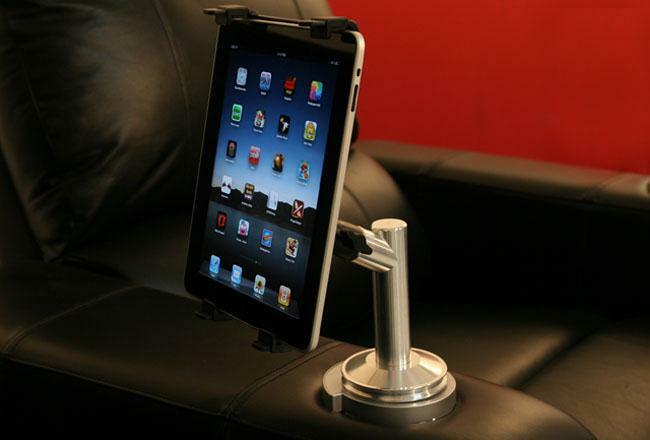 In addition, keeping your tablet charged has become less of hassle with the introduction of deluxe home theater seats like the Liberty and Horizon, which come complete with charging stations featuring USB ports. From there, you have the internet at your command. Internet streaming services like Netflix, Hulu, and Google Play offer thousands of movies and TV shows (commercial free!) to choose from. Recently Netflix has been focusing more on TV shows and original content, which has let Google Play and Amazon Prime offer a wider variety of movies. Therefore, it's best to become familiar with all the options at your fingertips, as between them you're bound to find what you're looking for. The recent debut of "The Interview" in the online streaming format has possibly set a precedent for further films being made available this way--meaning that home theater owners may be set to catch more first-run releases online in the near future. Youtube is also a great source for older films, TV, and especially live music uploads. Want to see The Beatles live on "Ready! Steady! Go!" in 1964, or the latest Taylor Swift video? Youtube is likely to have it, and watching these shows on the big screen, with the sound system that you spent so much time and care to install, is the only way to do them justice. Gamers will also have a field day with a tablet hookup, as the internet offers dozens of game sites that feature variations on classic board games and puzzles, with more sophisticated visual odysseys that will have you lost in their imaginative worlds. This entertainment option has come a long way since Pac-Man or Super Mario, now offering characters, plotlines, and beguiling visual backdrops that are more akin to user-participation movies than games. Once again, you will find a dramatic difference between playing these games on your tablet, and being able to do so with the advantages offered by a home theater setup. Besides gaming, you can also access personal files to conveniently share family photos on the big screen, or spend time on social media. 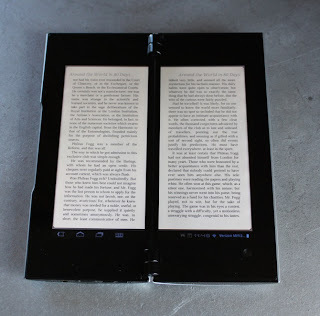 You won't ever have to squint if you wish to read an e-book, either, although with the tablet holder you can also read directly from your tablet while reclining in your seat without having to hold it in your hands. So what are you waiting for? Why agonize over having to figure out what movie to watch, only to find that you have to wait to purchase or order it? Get your instant gratification now by being able to browse to your heart's content from thousands of available choices--or decide to try that new online version of Monopoly. You'll never be at a loss, with your tablet hookup; the only problem will be how to narrow the endless list of choices down. Hollywood Award Season Is Here!